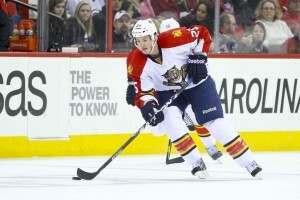 The Florida Panthers were quiet on Deadline Day, having made their moves in the days prior. General Manager Dale Tallon added Jerred Smithson from the Predators and Wojtek Wolski from the Rangers, and both players have paid immediate dividends. Smithson has shown his skills in the face-off circle, averaging a 56.7% success rate in his two games with Florida, and Wolski scored the game tying goal Saturday against Carolina hours after being traded. Florida added two contributing roster players and lost none, as just AHL defenseman Mike Vernace and a couple of late draft picks went the other way. It was a generally quiet deadline league-wide, so maybe it’s not such a surprise that the Panthers didn’t make any deals. The biggest piece that Florida had to dangle was defenseman Jason Garrison. He will be an unrestricted free agent this summer, and the rumblings are that negations have not gone well. But he’s been a rock with Florida this season on the top pair with Brian Campbell, and is 3rd in the league in goals from defensemen. With the Panthers currently holding a 2 point lead in the division with 3 games in hand on 2nd place Winnipeg, prying Garrison away from Florida now would have come with a big price. Heading into the deadline, there’s no secret that the biggest need for Florida is scoring. The Cats have given up more than two goals just once in their past 9 games, yet have lost 4 of those thanks to scoring 3 or more just once in their last 5. What the Panthers and their fans are holding out for is “adding” players by getting them off the injury list. No team in the NHL has played more players this season than Florida, as 41 different skaters have suited up, and most have been forwards. Scottie Upshall has been out since late January. Marco Sturm has played just once since the calendar flipped to 2012. Matt Bradley, Sean Bergenheim, Krys Barch, Jack Skille, and Mikael Samuelsson have all missed games due to injury. Adding to that now, Marcel Goc has missed the last 3 games, although his injury is still being considered day-to-day. Kris Versteeg sat out most of the 3rd period yesterday against Montreal and is doubtful on their upcoming Canadian road trip. The injury bug has set up a colony in the Panthers locker room. But as this team gets healthy, and with the addition of Smithson and Wolski, there will be serious competition for playing time. And when your ice time gets threatened, chances are players will step up. No player is hotter than Sean Bergenheim, as he’s scored 7 goals in the last 13 games. Mikael Sameulsson is starting to show the form he had before he was hurt, posting 1 G, 3 A in the last 3 games. Stephen Weiss, who had scored just twice since December 8th, equaled that with a two goal performance Sunday after being put on a line with Mikeal Samulesson and Bergenheim. As Goc, Sturm, and Upshall make their way back to the lineup, playing time will be even harder to earn. This should force players like Shawn Matthias to pick his game up. Matthias has seen playing time on the top line and the 4th. He’s having a nice year, scoring 10 goals this season, but he has the ability to double that if he can just find some consistency. Tomas Kopecky, Jack Skille, Mike Santorelli. All have shown flashes that they could be legitimate secondary scorers. Maybe once ice time starts to become harder to find, the flashes might become a bit more frequent. It could turn into a pleasant little dilemma for coach Dineen. Tallon and assistant GM Mike Santos have been saying it all season. This is a long term project. Squeaking into the playoffs as a 6th, 7th, or 8th seed is not the goal. This will be a team built to seriously contend for many years. Of course everyone is excited about how the team has done so far, but management simply was not going to risk the future of the team by selling one of their many highly touted prospects or high draft picks for a short term rental. Maybe that’s because the pieces are already there.